Halloween is looming and yesterday I started having a think about what costume I could create this year. Every year I promise myself I'll dress up as something creative, and every year I end up forgetting about it then rushing up a cat outfit on the day. The morning after is spent scrawling through Instagram looking in envy at all the gorgeous, clever and funny Halloween costumes and make-up so this year I've made an effort to think about my costume way in advance and experiment with some Halloween make-up. 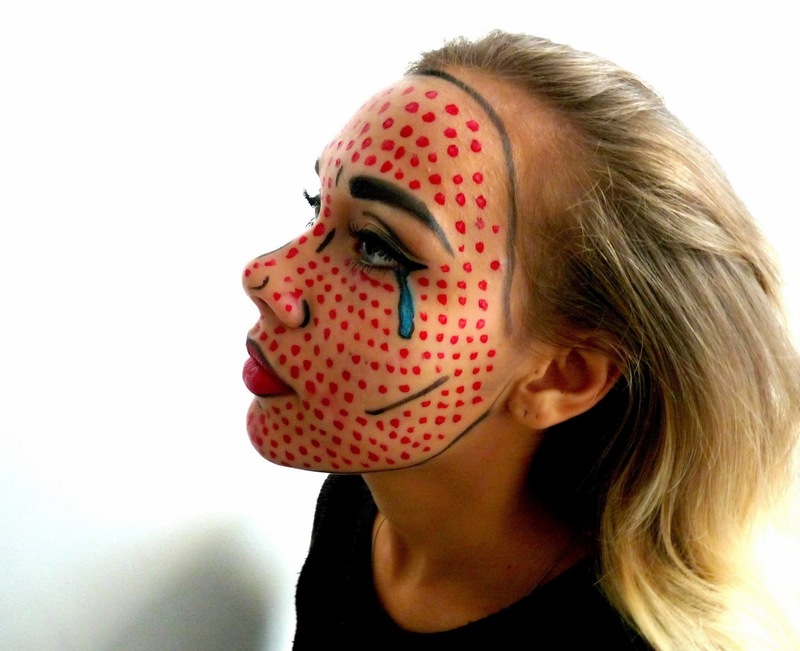 This make-up look is inspired by the pop art era and would look great on Halloween with a neon wig and a 50's style dress for a costume that is definitely unique and will make you stand out from the crowd. I don't have any face paint to my name and so this whole look was created just from my make-up kit, so any one can recreate it, no fancy face paint required! The easiest way I found to produce this look was by doing my eye makeup first, then all the face lines in a combination of black eye-shadow and black eyeliner; I used Soap & Glory's Supercat Eyeliner, which you can read my full review of here! I finished up that section by filling in my brows with a black eye-shadow (you can use any, but I used one by ELF) before moving on to start the face dots. I used lip laqueur for my lips and the dots on my face to give another dimension to the look plus extra shine which I find a little bit harder to create and maintain with something like eye-shadow or eyeliner. I actually found it a little tricky to find a brush from my kit that gave me half decent circles every time, but after a bit of trial and error I ended up using the corner of my eyebrow brush which I think did the job fairly well. In the future though I would definitely try to find a little sponge or something that I could use as a stamp for neater dots. And viola! After dotting my whole face (you think it's not going to take long, and it actually takes forever), the look was complete. I'd definitely recommend this for a house party rather than a club night as there are so many aspects of this look that are vulnerable to smudging, but as long as you keep an eye on your face throughout the night you'll have a gorgeously creative face for the whole of Halloween night and definitely no more post Halloween make-up envy! Please let me know if you try this for yourself (tweet me a pic if you do- @catherineywy) and also leave links to your own Halloween make-up posts, I'd love to see them. Love this costume! Thanks for the idea! This looks flawless! The makeup is just stunning and I wish I could do mine like this for Halloween! Wow this look SO good! I can't begin to imagine how much effort and time went into it, well done. artistic makeup inspiration. love it! So gorgeous, but I just wish I had the patience for this. I would end up with just half my face done! This is way cool! 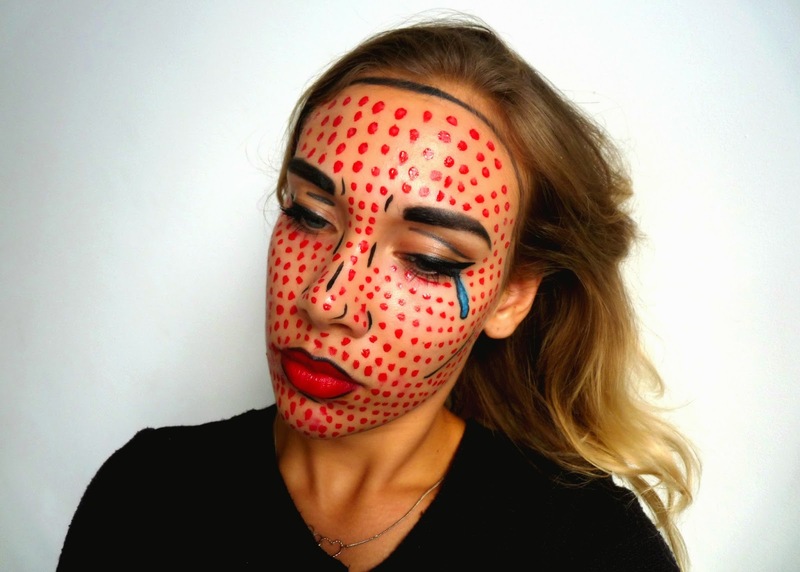 A pop art costume is genius! I wish I had the time and patience to put this into practice. I imagine you'd be the coolest person at a Halloween party! This is such a cool Halloween look! And so original, I'm going to attempt to recreate gaga's skeleton look, thanks for the motivation! You're very talented and creative with your Halloween makeup artistry. I love your winged eyeliner and Elf eye-shadow.